Filmmaker: Rev. Sensho Sasaki. Transfer Note: Five sequences copied at 18 frames per second from two 16mm prints preserved by the Japanese American National Museum. New Music: Martin Marks. Running Time: 7 minutes. For a window into the daily life of ethnic Americans before World War II, no source surpasses amateur filmmaking. Like the rural towns seen elsewhere in this anthology, ethnic communities held little interest for mainstream filmmakers. Rev. Sensho Sasaki (1903–72), a twenty-fifth-generation Buddhist priest, took these movies of his family and others in West Coast Japanese American communities. (He can be glimpsed briefly in these excerpts, lighting a cigarette.) Rev. Sasaki took up amateur moviemaking soon after 16mm safety film was introduced in 1923. 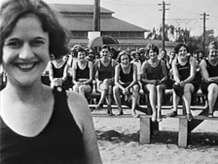 The shots of giggling girls dancing a sidewalk Charleston and the baseball players were taken around 1927 in the California Central Valley city of Stockton. Later Rev. Sasaki moved to Washington state and the Tacoma Hongwanji Buddhist Church, around which most of the subsequent sequences were taken in 1932—as dated by his homemade intertitle—during the "NWYP's [probably North West Young People's] Third Annual Buddhist Federation Convention." No one can know what Rev. Sasaki would have wanted for musical accompaniment to his footage—nor if he even wanted any music at all. Of course, such uncertainty pertains equally to many of the other examples of amateur filmmaking in this anthology, but here it is compounded by the subject matter. Assuming (as I do) that this film ought to be enhanced by music, one must then decide upon its character, whether mainly "Japanese," mainly "American," or some mixture of the two. This score is basically American in style, taking its cue both from the West Coast settings and from the activities depicted. The children dancing the Charleston and the baseball game prompted me to play some familiar American songs and the "National Emblem March" by E.E. Bagley. Still, I sought Japanese inflections by incorporating pieces from the silent period that were intended for travelogues, "exotic" stories, and the like. Home movies by Rev. Sasaki and other Japanese Americans were preserved in 1999-2000 by the Japanese American National Museum through Treasures of American Film Archives funding. Additional footage from Rev. Sasaki is included in Moving Memories (1993), a video production of the Japanese American prewar community featuring home movies archived at the Japanese American National Museum, produced by Karen Ishizuka and created by Robert Nakamura. Their Something Strong Within (1994) documents America's World War II domestic detention camps through amateur footage taken primarily by Japanese Americans.